Do you love mushrooms? As an occult fan on mushrooms, I love em fried, sauteed, stuffed, steamed, stir-fried, grilled and many other cooking methods. There are a lot of edible mushrooms out there, but I shall narrow down my favourites to truffle & portobello. 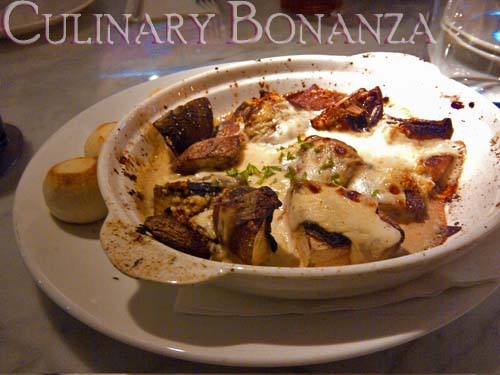 The Funghi Gratinate is made of portobello mushrooms and béchamel sauce, cooked gratin style. What is gratin by the way? it's a way of grilling food that is topped with cheese until the top layer is brown and crisp. The cream sauce tasted just perfect with the mushroom, I can't explain further, you just have to try it for yourself. Thinking that I could use some energy boost to stay awake that evening, I ordered the Mocha Piccolo. 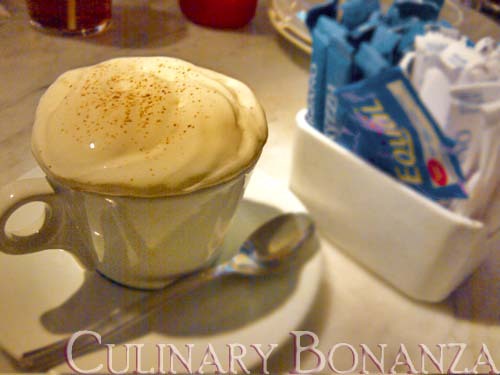 The whipped cream on top was really thick, so I stirred it into the coffee. At the end of my meal, I found my coffee very oily! Yuck, I promise never to mix my coffee with whipped cream anymore! BUT, I was rather annoyed by the fact that the staff didn't attend to our table properly. Well, I know it was Friday evening, resto is packed, everyone's busy and hungry. But hey, we are paying too and what's more, my table was actually a big table (it was a small reunion with my friends). I hope Pizza Marzano will pay more attention to this and not disappoint in my future patronage. Oily coffee..yuck! must be really bad, eh? Now, I'm curious why you said, "I hope Domino's will pay more attention to this"?Why Domino? What's the relationship between Pizza Marzano and Domino?